I can’t claim the recipe for this salted maple pie as my own, but I love it so much that it feels like my child. 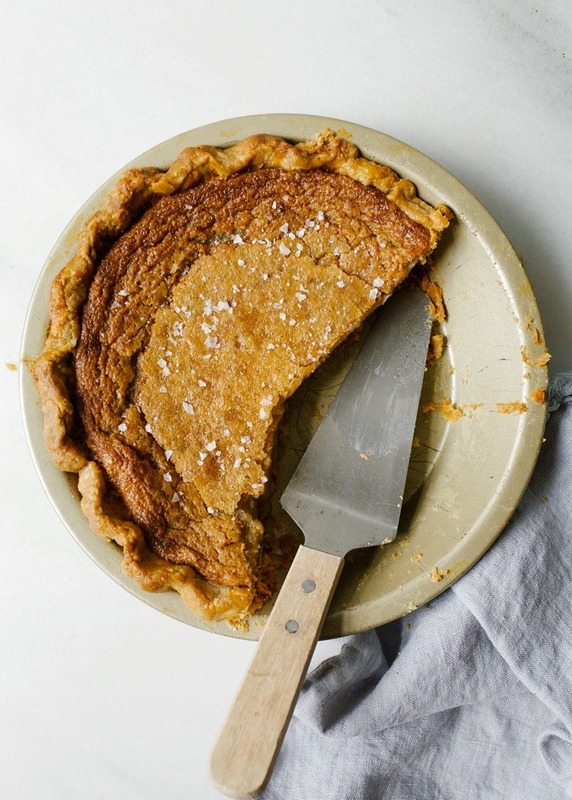 This pie, straight from a brand-spanking new book called “Sister Pie” is a winning treat that your falls need. Trust me. Something I’ve been learning about over the last five or so years of my life is how to celebrate others. There was a period of time in my life where my own insecurity prevented me from whole-heartedly cheering on the people around me. I guess I thought that if someone else was successful, hitting milestones faster than me, or achieving things I wanted in my own life it would somehow diminish my own gifts and the good things in my life. Like someone else’s advancement meant I was stuck behind. Obviously that type of mentality was gross and damaging for a number of reasons, but I think the thing I missed out on most was the opportunity to share in the joy of someone else’s successes. One of my favorite things about life in a small town is how friends, neighbors, and even complete strangers can come to feel like family. In the confines of a tiny city, it’s easy to recognize how closely your life is knitted to the people around you and wanting the best for them becomes an absolute no brainer. Their struggles become your struggles, their joys become your joys, and the triumphs and blessings in their lives will eventually trickle down to affect yours in a positive way too. When one person succeeds in a small town, everyone eventually shares in that reward, and I’ve found that taking part in their stories, investing passion and love into the things that are important to them, almost always feels like a shared victory in the end. This way of living, this crazy love and support for the people around you, is is one of the most heart-filling things I’ve ever experienced in my life, and if you’ve felt it too, I bet you’d agree. 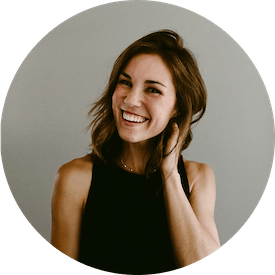 This notion of sharing with and loving your community is all over the “Sister Pie” cookbook. Just a pages into the book, and you’ll know that these gals are all about taking care of the people (and bellies) around them. The stories are great, but the recipes are crazy good, so much so that I knew I had to share one with you. 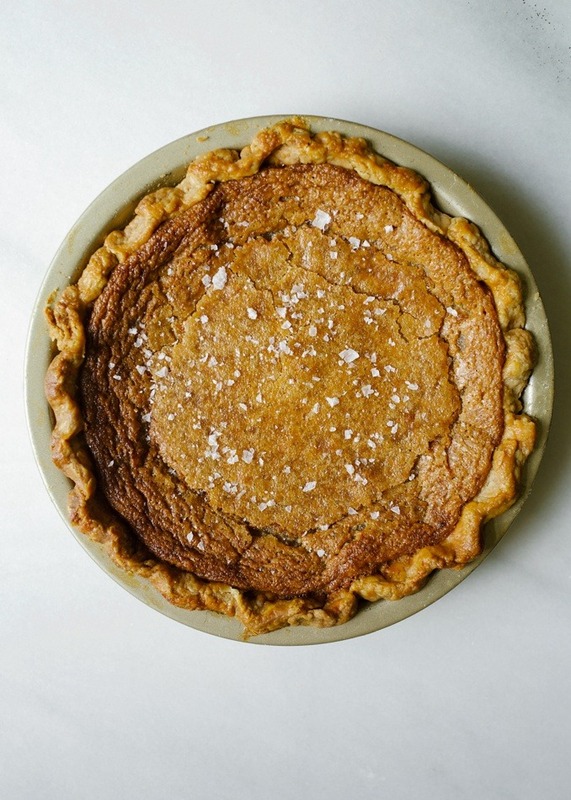 The salted maple pie was my first bake from the book, and I have a feeling it’s one I’ll be making for years to come. 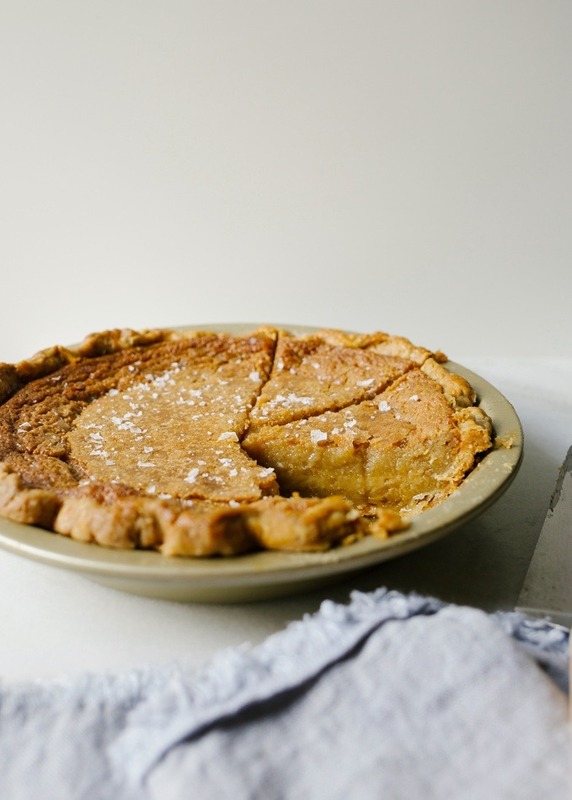 With it’s rich, almost chess pie-like filling, equals parts sweet from maple syrup and salty from finishing salt, this salted maple pie satisfies my dessert cravings on so many levels. 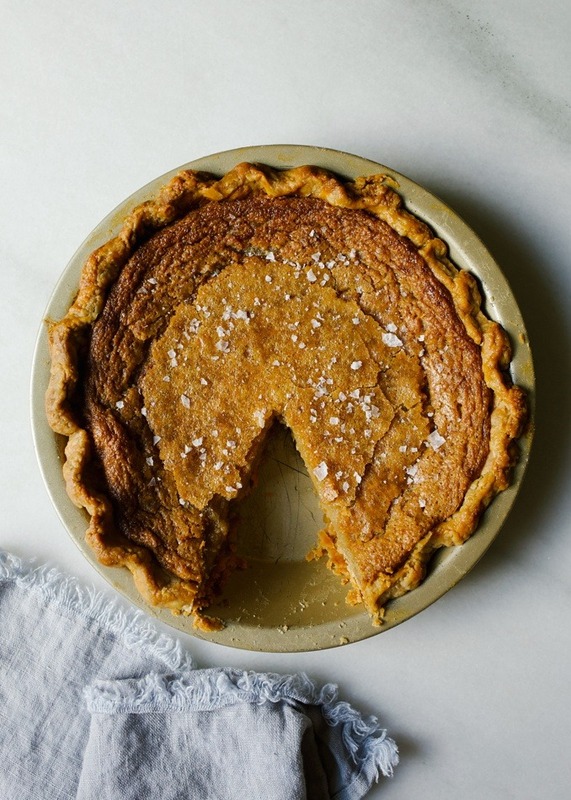 There’s the buttery, crispy pie crust, the gooey (think Crack Pie from Milkbar) filling, and those perfect little crunches of flaked salt to finish. I shared this pie with a group at our church and I literally had someone come up to hug me because it was so good. If you think food can’t bless the pants off of someone, think again. To make it, we start with Sister Pie’s crust. Their classic all-butter pie dough utilizes European style butter which has a higher fat percentage and less water. This means more flake and more flavor in your pie. The crust gets blind-baked until set and starting to turn golden, and in the meanwhile you can prep your filling. Just like with my favorite chocolate chess pie, this pie gets whipped up in a single bowl. 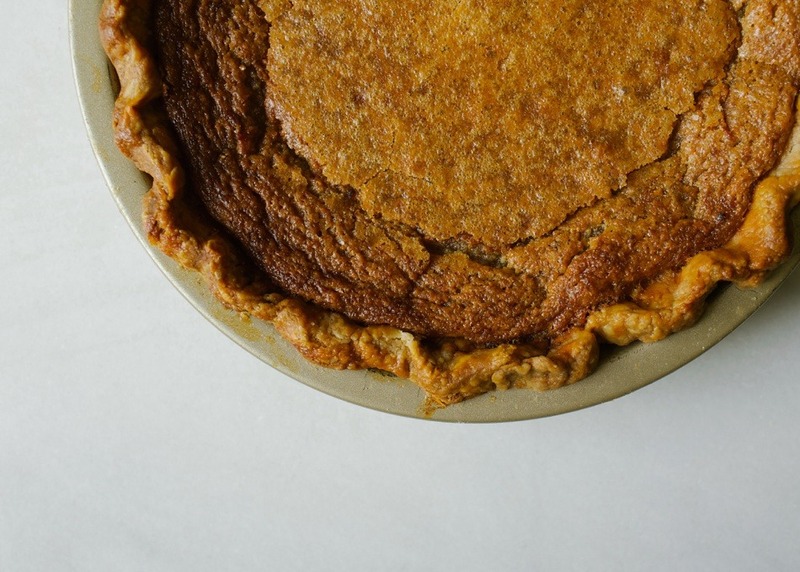 Eggs, butter, maple syrup, cream, and a few other ingredients are stirred together until the crust is finished. Pour the filling in and complete the baking process until the filling it barely puffed and only jiggles a little when you shake it. Allow the pie to cool on the counter, about 4 hours, until set. Finish with a sprinkle (or two) of salt. 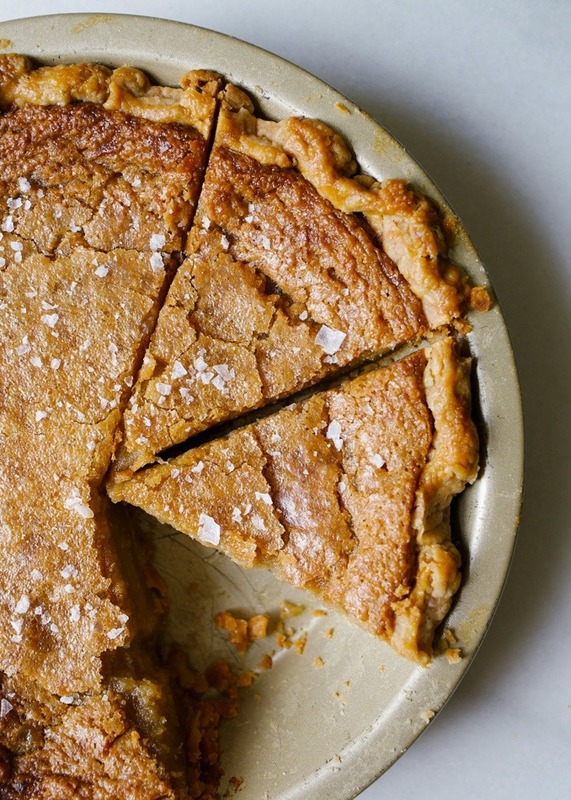 This salted maple pie is like a gooey autumnal hug. The flavors are cozy and complex, an extremely satisfying ending to any meal. I hope you’ll give it a try and check out the new “Sister Pie” cookbook! There’s loads of inspiration, both sweet and savory, within its pages and I think it’s one you’ll reach for for years to come. Happy reading, happy baking, and happy Wednesday! 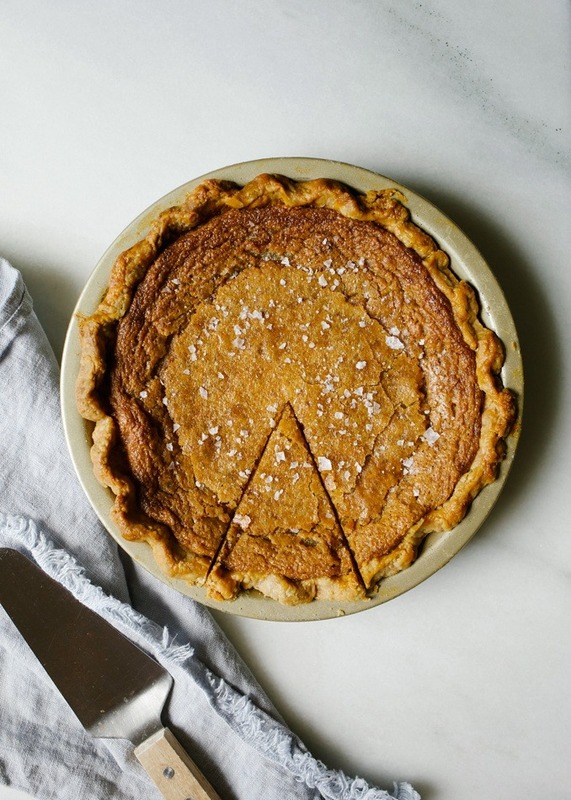 The Salted Maple Pie is our signature flavor at Sister Pie because it is an homage to the bakeries where I got my professional chops: Momofuku Milk Bar in Manhattan and Four & Twenty Blackbirds in Brooklyn. It is reminiscent of the addictive quality of both Milk Bar’s Crack Pie and Four & Twenty’s Salty Honey Pie. We created our own version of a classic chess filling with robust Grade B maple syrup from Imlay City, Michigan and highlighted with local heavy cream, eggs, stone-ground yellow cornmeal, and light brown sugar. On Saturdays at the shop, we’ll buy applewood-smoked bacon from the market to crisp up in the oven right before opening. It’s a match made in pancake breakfast heaven. Make the filling: In a medium bowl, combine the melted butter and maple syrup. Whisk in the brown sugar, cornmeal, and kosher salt. Crack the eggs and yolk into another medium bowl. Add the cream and vanilla and whisk until combined. Slowly pour the egg mixture into the maple mixture and whisk just until combined. Place the blind-baked shell on a parchment-lined baking sheet. Brush the crimped edge with the beaten egg. Pour the maple filling into the pie shell until it reaches the bottom of the crimps. Transfer the baking sheet with the pie on it to the oven and bake for 45 minutes to 1 hour, until the edges are puffed and the center jiggles only slightly when shaken. It will continue to set as it cools. Remove the baking sheet from the oven and transfer the pie to a wire rack to cool for 4 to 6 hours. Once fully cooled and at room temperature, sprinkle generously with flaky sea salt, slice into 6 to 8 pieces, and serve. Store leftover pie, well wrapped in plastic wrap or under a pie dome, at room temperature for up to 3 days. In a large stainless steel bowl, combine the flour, sugar, and salt and stir to mix well. Place the sticks of butter in the bowl and coat on all sides with the flour mixture. Using a bench scraper, cut the butter into 1⁄2-inch cubes. Work quickly to separate the cubes with your hands until they are all lightly coated in flour. Grab that bench scraper once again and cut each cube in half. I always tell my pie dough students that it’s unnecessary to actually cut each cube perfectly in half, but it’s a good idea to break up the butter enough so that you can be super-efficient when it’s pastry blender time. to incorporate any dry, floury bits that have congregated at the bottom of the bowl, and once those are completely gone and the dough is formed, it’s time to stop. For the water/vinegar mixture, fill a 1-cup liquid measuring cup about halfway with ice, then add water and 2 tablespoons apple cider vinegar. I love maple pies! I can’t wait to try this one out! This looks so good! Thank you for sharing! I’m happy to have come across your site because I have never thought of maple pies before. The only use of maple syrup I’ve ever known is for it to be drizzled on pancakes. I love maple syrup, not only because of it’s sweet taste but also because of its nutritional benefits, and one of maple syrup’s benefits includes its antioxidant properties. I’m thrilled you enjoy this recipe! I just took this pie out of the oven an hour ago. It seems very oily from the butter. Is that normal? Hmmm… where is the oiliness? On top? Was it cooked until only barely jiggly in the center? It is an incredibly rich and butter-heavy pie, but I didn’t note any odd greasiness. Sorry for the delay in responding. Hi Kate! I was wondering if you used self-rising cornmeal for this recipe? I saw a couple different kinds at the store. Also, any tips on where to find Grade B maple syrup? So far I’ve only been able to find Grade A. Excited to try this recipe, love your blog! I the recepie you’re supposed to use a water vinegar mixture but there’s no instructions on how to make it. Is it just equal parts water and white vinegar? so sorry! I’ve made the correction! hooray! I’m so glad you enjoyed this!!!!! this looks perfect for holiday baking! what is the ratio of ice water to vinegar in the water-vinegar mixture? and what kind of vinegar would be best? Yum1 I tried Salted Maple Fudge a few days ago and it was to die for – this pie looks the business! hooray! thrilled to hear this! Hey Kate! I posted a comment earlier asking about butter but it never got posted or replied… I still need to know what’s the normal fat content in American butter and what’s considered European-style. 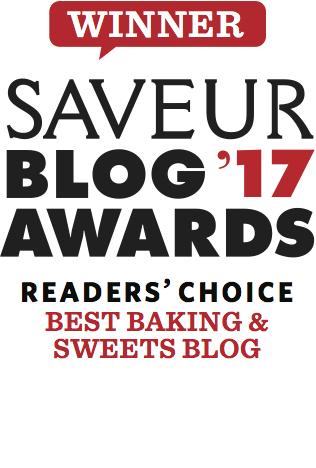 Do you have a recipe for maple syrup, sea salt cookies? And up until this moment I had no idea America had different butter… Could you please mention the fat content in American butter, for future reference (I am guessing that would be the one most commonly used in the recipes here)? And for clarity, the fat content in what’s considered to be European style? I love this reminder to keep lifting each other up. I feel so lucky to have grown up in a super supportive community in Minneapolis and that spirit is something I try to bring with me wherever I go. I get the feeling that you are a deep well. Thank you for sharing this! I’ll bet subbing some maple sugar for part of the brown sugar (I’m thinking 1/2-3/4 cup) would really amp up the maple flavor. What if I can’t get European butter? Would it be best to sub in some lard? What a great reminder. There is plenty of God’s goodness to go around. And what a great looking pie! I can almost taste it!! Love!